I was first introduced to the work of Steve Jenkins through his book Actual Size, while I was working as a librarian. It was tucked away in the nonfiction section and as such, didn't see nearly as much use as such an engaging book deserved. I talked it up and put it into parent's hands every chance I got. He has written many more since those days, each with his very distinctive cut paper illustrations that are layered and super realistic-looking. It wasn't until I was looking up some more titles, in order to choose some to highlight here, that I realized that he and Robin Page (his wife) have collaborated on a whole slew of them. He does the illustrations, and they both author it. Reading levels vary. Some are great for even preschoolers, while others are more geared for elementary school-aged kids. 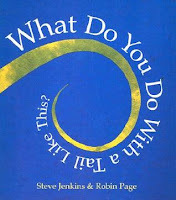 Even the ones with longer text, though, have headings plus those fantastic pictures to read and look at on each page. Also, at the end of nearly every book, he has a short section for each animal mentioned with further details. Nearly all of their work is remains in the nonfiction section, so again, it probably doesn't see the light of day as much as it really ought to. 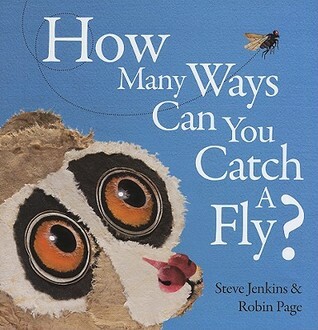 They have a gift for asking a question, or looking at some aspect of animal life with enough of a twist to make it really fun to learn about. I have to admit--one of the reasons I chose to highlight them was to figure out which books I want to purchase! 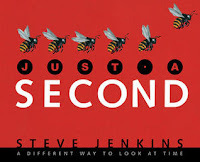 His website is: http://www.stevejenkinsbooks.com/ Among other things, he has a link to how he makes the books, including a short video. I get the feeling that his wife wants to stay out of the spotlight--there's not much about her on there! I have yet to find a kid (or adult, for that matter) who can resist putting their hand on that big gorilla's hand to see how they compare! 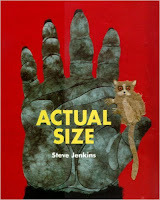 As the title suggests, the illustrations in the book are the actual size of that animal (or animal part) in real life. So cool! This one has full size fold-out pages in the middle, which are a little worse for the wear in our home copy. Doesn't stop us from reading it though! Compares bones from people to various animals. For instance he shows how almost all human and animal arm/hand bones are made up of the same basic pieces: 1 long for the upper, 2 smaller for the lower arm, lots of little wrist bones, plus the finger/paw bones. 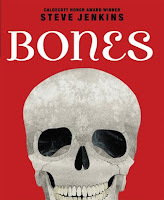 A note at the bottom of each page lets you know the scale he used to create the bones. One set of foldout pages in the middle shows the skeleton with the highest number of rib-bones--a snake! Another set shows skulls in comparison with a human skull--actual sizes, while a third set of foldouts shows all the bones of a human body separated, then put together. 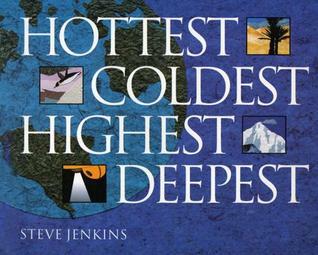 In this book, Jenkins starts at the surface of the ocean, listing what lives here, including animals or fish that frequently jump out of the water. The measuring stick on the side of every right-hand page lets you know where you're currently at, and how far down there still is to go. The narrative continues on down through the Sunlit Zone, the Twilight Zone, The Dark Zone, The Abyssal Plain, Hydrothermal Vents, and finally the Marians Trench. Each zone gets at least a 2-page spread, most get 3 or 4 sets of pages. Each page has1-2 paragraphs of text on it, written in a conversational style as though you were on the expedition. 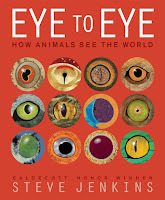 This one starts off by talking about 4 different kinds of eyes, then it starts into several different animals and how they use they their eyes. A bit more text in this one than some--a paragraph per page. I read it to my 4 year old recently and gave a short summary while we stared at the pictures. One thing we both liked about the illustrations in this one was that each animal has a close-up of their head, then a smaller, complete version somewhere on the page. Just what it sounds like: extremes. In addition to places referred to in the title, there's everything from windiest to most extreme tides. Each 2-page spread includes a map, and an inset comparison chart. The cut-paper collages are quite beautiful, too. Lower reading level for this one, with 1-2 sentences per page (though there are quite a few names that would make it harder.) Smaller-font paragraphs on each page give a little more info. My kids can't get enough of this stuff! How Many Ways Can You Catch a Fly? This book is in question/answer format. So you start off with a question: "How many ways can you snare a fish?" Underneath the question are pictures of several predators that eat them. Turn the page, and dynamic illustrations show each of the predators in the act of catching the fish, with short explanations next to each. Everything from hatching an egg to eating a clam. 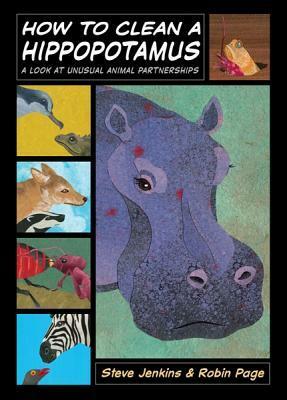 More detailed information on each animal included at the back of the book. So much to learn here! Symbiotic relationships have always fascinated me, and this explores several that I didn't know about. The illustrations are different than in most of their books. They're still the cut-paper realistic-looking animals, but these pages are laid out in panels, rather than blank space with the animals overlaid on top. Many of the panels are full-scene collages. some done in silhouette. Each panel has text on it as well. 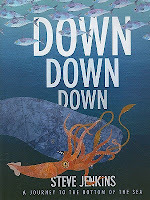 It's a little bit harder to follow, so this one would probably be best for older readers, or to read out loud so you can point your kiddos to the next one in the sequence. The info in the back lists only size, habitat, and diet of the animals discussed in the book. Step-by-step instructions for all kinds of practical survival techniques, from building a web to disguising yourself like an octopus. Each step is illustrated with humorous encouragement. "If you want to make a paper wasp nest, get ready to do a lot of chewing." As usual, additional information on each animal can be found at the back. Time is something made up by humans. 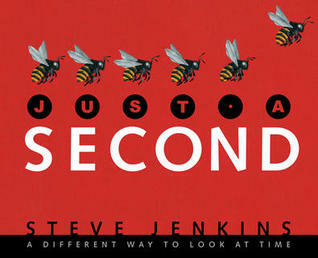 Jenkins illustrates several things that can happen in one second, then one minute, one hour, one day, one week, one month, and one year. Then a few pages show things either very quick or very long. It ends with a timeline chart showing average life spans of several plants and animals (illustrated). 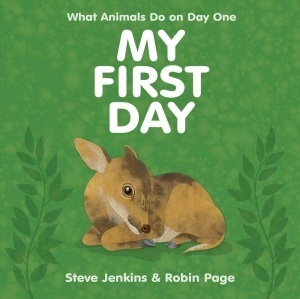 Perfect for preschoolers, this one is written in 1st person, as many different baby animals share what they did on the day they were born. More information on each one at the back. There's a sweetness to this one that I really love. Also, more of a narrative than most of the others, which tend to be more collections of facts. 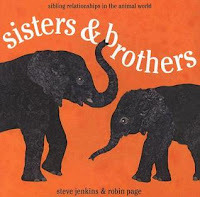 After a few pages about different numbers of siblings, it shows examples of animal siblings fighting, playing, learning together, working, and so on. Each page has about 2-3 paragraphs of information to read; as usual, there's further details on the animals in the back. Another one geared for younger readers, this one shows how several different kinds of animals bathe. Simple text and those awesome illustrations. I wish this one was around back when I was doing storytime! 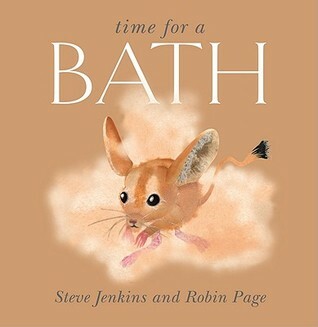 It would have been perfect for the bathtime theme! This is part of a series--some of the others are Time to Sleep and Time to Eat. This one won a Caldecott Honor in 2015. 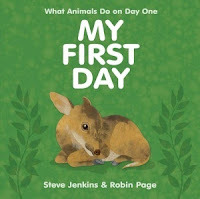 Written as a guessing game, each set of 4 pages start off with a 2-page spread featuring just one animal body part: so tails, ears, noses, etc, and the question: What do you do with a _____ like this?" The following set of pages shows the whole animal and gives a brief description of how they use that particular body part. This book is a guessing game that never gets old for my 4-year-old! Even though he knows what they all are, he finds great satisfaction in pointing to each body part in question and naming the animal it belongs to, then proving that he was right as we turn the page. Good thing this is the other one we own. For the win! Are you familiar with these authors? Do you have a favorite? If you're not, please do yourself a favor and check them out! You won't be disappointed. 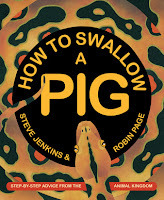 The How to Swallow a Pig one sounds pretty funny! The paper art thing reminds me of Eric Carle somewhat. I'll bet my kids would like some of those books. They love nonfiction, especially about animals. Thanks for talking about them! Yes, the artwork is similar to Eric Carle's. I don't think Jenkins paints his first, though. I hope you enjoy them! I think they're great! We have read a few of these but I had no idea there were so many! 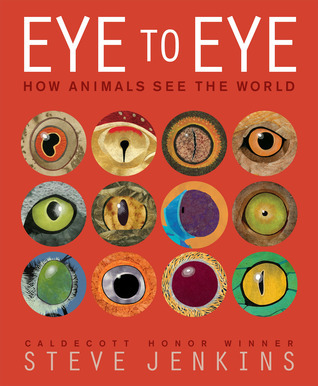 My boys love non- fiction books about animals so now I have a whole new list! Thanks & Pinned!